Queensland Health staff that need to book an interpreter now (emergency or after hours), should go to the How to request an interpreter - after hours or emergency session page on QHEPS. For non-emergency bookings, staff should contact their local interpreter service coordinator. 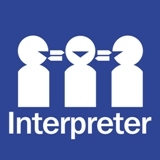 Non-government organisations funded by the Queensland Department of Health/Hospital and Health Services should contact the NGO Interpreter Service. You can provide your feedback in writing by downloading the feedback form and fax to the relevant Interpreter Service Coordinator. You can write your feedback in your preferred language. If this is a language other than English, Queensland Health will arrange to get this feedback translated.